No matter the genuine reason behind an intentional killing of oneself, this act cannot be tolerated by any right-thinking person. Cameroonians like citizens of other nations dread self destruction of persons, or institutions despite the reason behinds such acts. The ongoing crisis in our country since October 2016, and the apparent inability or unwillingness to stall the unfortunate developments have triggered regrettable events that could usher in more unpleasant surprises. This year’s GCE results are a glaring example. The results could not have been better considering that most of the children were not at school for normal classes owing to a strike action that had apparently become endless. Regrettably, while the rationale of back to school is being harped upon, some compatriots do not see anything wrong in sacrificing the future of children, and that of the nation on the altar of greed and politics. What a shock! Most Cameroonians appreciate what Government has done since late last year to weather a socio-cultural storm triggered by the teachers’ and the lawyers’ strike action, but strongly appeal to compatriots, leaders and the led, to reflect on the pride of our country which had proven that a colonial wrong can be corrected. Such reflection should be followed by patriotic commitment to all that is needed to admit that human errors can be corrected through love, dialogue and compromise. For, these are elements of the magic wand that effects miracles in communities. 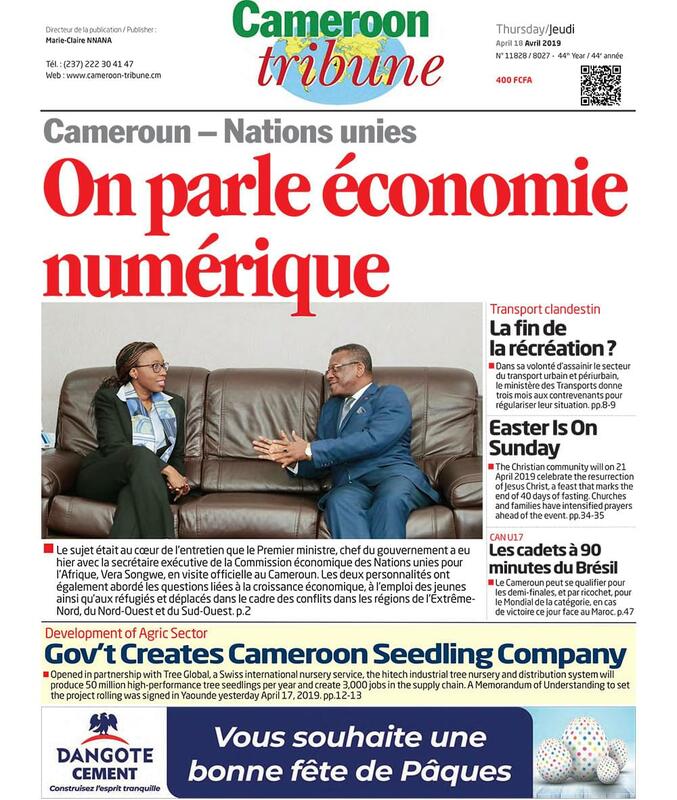 The rest of Africa and the world at large are waiting to see if Cameroonians and their leaders have learnt from the ongoing crises, and are bent on weathering the stubborn storm before it weathers them out. Let us not take things lightly. For, the damager ahead is evident if we are not prudent. When the political elite of yesteryears met in Foumban in July 1961 to delve into implications of a peaceful and effective reunification of compatriots that had been separated by colonialism for 45 years, their patriotic aim was to set up political unit that would last in spite of socio-cultural diversities. That was not wishful thinking. That today, the societal ills of inertia, selfish politics and the political game of numbers is threatening our unity, is deeply regretted and must not be tolerated by truly patriotic citizens. Dialogue must be given a chance, differences x-rayed, the frustrated given a sympathetic ear, government efforts of appeasement appreciated, and action taken so that innocent children can go back to school while their parents continue to work together for their future and that of their country. We must not forget that those who envy our socio-cultural prowess and position on the African continent are not only ready to fund the detractors and insinuate through unpatriotic compatriots abroad, but also do not want to see this crisis stalled, and our pride sustained. Are we going to allow this to happen in spite of our intellectual attributes? God forbid! We must selflessly work together for the pride and progress of the country and its enviable endowments. We must swim to safety instead of drowning in waters troubled by opportunists, and unpatriotic elements despite their societal positions. The selfish in spite of their level of development, must not be allowed to mislead us. Time has come for us to review the painful costs of this crisis and embark on what must be done so that together, we stall this nightmare. We must avert this socio-political and economic suicide by swimming to safety instead of drowning.